Oh my! The wind is really strong today! The trees and bushes are whipping about as if in a dance competition. Right now, the bushes are winning hands down. About 70% of the snow has melted off. Our once spectacular drifts are now mere 2-3 foot pitiful, sloshy, masses of dirty snow. I hate it when all the beautiful “white stuff” no longer IS. Lots of traffic in the cul-de-sac this morning. Why? It’s a cul-de-sac, not a through street! About my little sister and her family. It’s so tough being unemployed. We were there only two short years ago. Other than a health crisis, I’m not sure anything is more stressful on what is normally a solid family unit. … the result of all that wind. The trees may be dancing a merry jig in an attempt at “one-upping” the bushes, but the noise they are making sound like bees. Yeah, I know strange. But in trying to discover a way to describe the sound I’m hearing, I can only come up with the very angry noise of bees. … the fact we don’t have a lot of bees around here. I’m allergic. Those epi-pen shots and subsequent ER visit are never very much fun. I think it’s a RIOT how these prompting questions sometimes get me off on a tangent! Seriously, today I am extra thankful for steady employment for hubby. He pays our bills (barely), and it is steady enjoyable work for him. A tan sweatsuit, tennis shoes and a cream-colored turtleneck underneath. It’s cold! I’m also wearing glasses, which for me is WEIRD. I have very itchy eyes, and opted to do without the contacts today. I think the itchy eyes are from the increased usage of our furnace making the air extremely dry. My skin is dry as well… where did I put that Neutrogena Skin care cream? … is wonderful when you want to hear the evidence of what your eyes see in that WIND. … the fact that 4 years and 9 months ago, I couldn’t hear the sounds coming from things my eyes could see. Not blowing, dancing trees and bushes, nor people’s words coming from their mouths, the clickity-click of my keyboard, the whir of the ceiling fan overhead… and so much more! 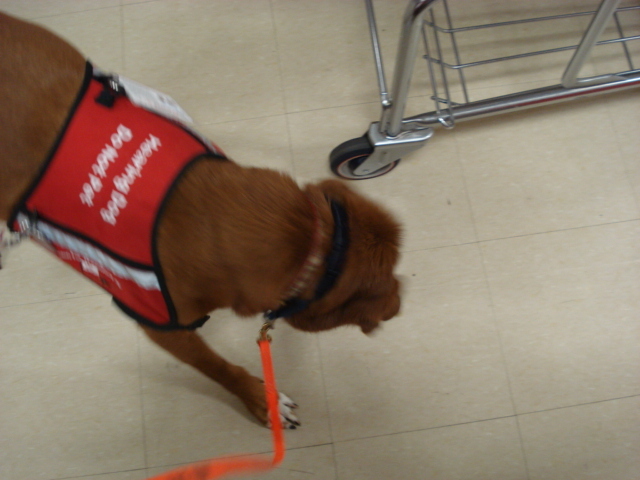 … to Fidos For Freedom tomorrow and bonus – – Kyersten is off so she can come with me! I really enjoy these trips to and from the training center. 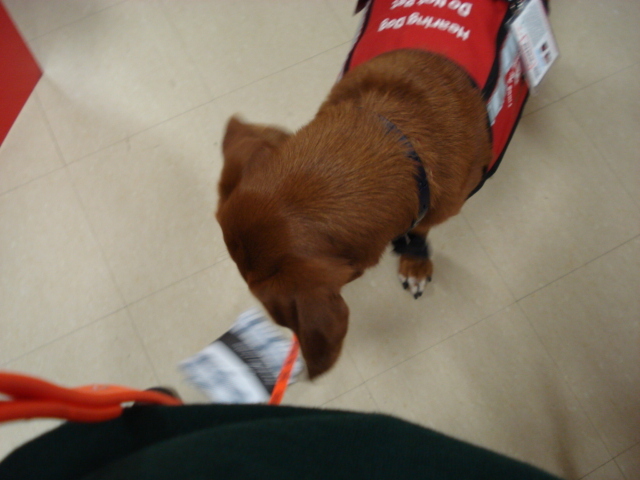 She loves helping out there and working “spare dogs”, and it is something I am glad to share with her. She’ll be gone this fall, and I’ll certainly miss this one-on-one time with her. Sniff. Fold a load of towels, remind my son to vacuum, and finish a research paper for my class. … always easy. Case in point, my Meniere’s disease/rainy weather caught me by surprise this week. After a couple of unexpected falls and resulting bruises, I allowed myself to feel sorry for myself for 5 minutes. I set the timer, wailed, Chloe let me know when the timer went off, wiped my tears and blew my nose… and GOT ON WITH LIFE. Poor Chloe isn’t sure what to do when an alert is suppose to happen but I’m wailing into my pillow. Her normal, eager bump/kisses are a tentative tap with a paw. I look up and she wags her tail cautiously. Poor thing isn’t use to my pity parties even after being with me as long as she has. Maybe that means I don’t have them very often? … for so many things I can’t list them here. Many are constant prayer requests, some are simple quick wishes like a cup of hot cocoa! … it will look pretty good around here once my son vacuums! … is Earl Grey tea. I have a pot brewing in the kitchen right now. I can’t wait to get to it! … is not resting well at night. He resembles Darth Vader as it is with his sleep apnea gear on his face at night, but he’s been twitching and scrambling about the bed covers. 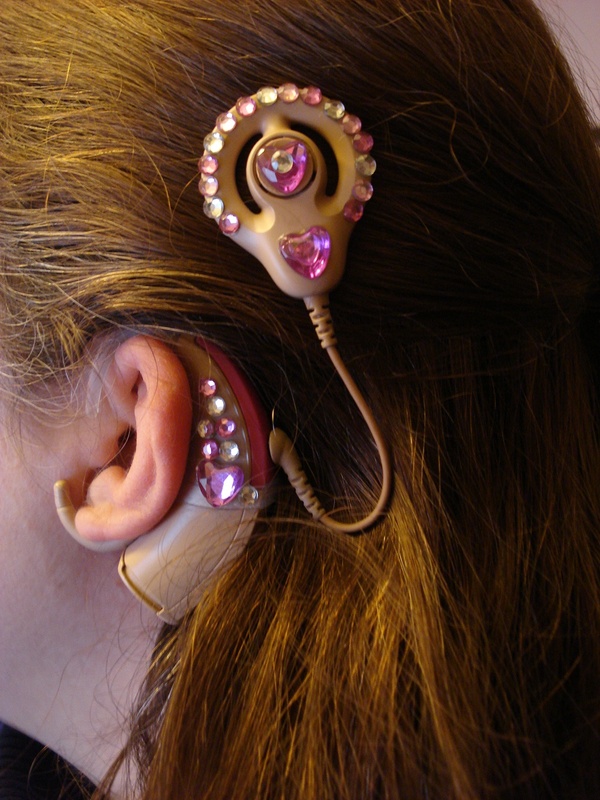 I’m deaf (without my cochlear implant), but I’m not dead. He practically tossed me out of the bed last night at one point. I smacked his arm and told him to cut it out. I think he is having nightmares. I need to talk to him… BEFORE we turn the lights out tonight. … doesn’t eat enough to keep a mouse alive. Ok, alright! Perhaps she eats plenty to keep a mouse alive… sigh. Yeah, she eats enough to keep a whole FAMILY of mice alive, but she doesn’t eat enough to satisfy MOM. She’s such a tiny little thing, and doesn’t eat the most healthy choices when she does choose to eat. I may have to start fussing at her again. Her clothes are loose and I’m going bananas sitting across from her at family meals seeing her 1/2 empty plate. … is not gonna be happy when MOM comes stomping downstairs with an ultimatum about the vacuuming. … is asleep in a sun patch. 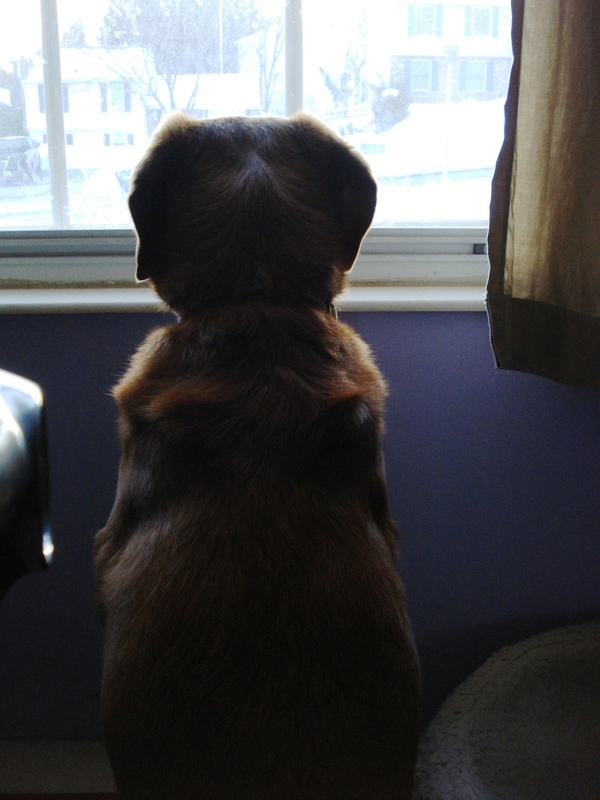 She and Tyco (our Norwegian Elkhound family dog) have been growling at the howling wind. Chloe and I were at Wal-mart this morning. Actually we are at Wal-mart every Tuesday morning. We are as predictable as a sunrise. About a year ago someone told me that Tuesday morning was the time to go to Wal-mart because you never had to wait in line. Since I found out that person knew what they were talking about, that is when I go each week. I had stopped going actually, because the lines, crowd and NOISE were just unbearable no matter how much money I saved. As it turns out, Tuesday morning is the time to go to Wally World! Now I save the family money in our grocery/necessities each week by going again. Chloe does not mind going because there is stuff to pick up all over the place! She loves helping. Her tail wags the entire time we are there. As I parked, I noticed out front one of those small buses that many retirement centers use. I took note of the large crowd of seniors throughout Wal-mart. In the laundry section, I came upon a couple who looked to be about 70 or so. The lady was in a wheelchair. She made “kissy noises” towards Chloe. Well to a dog, that “kissy noise” means come over here… in any language evidently. Chloe couldn’t resist and I didn’t correct her. I was a little nervous because the lady was very frail, and Chloe moved in closer to rest her front paws on the side of the chair. The lady put her arms around her and talked to her. Her hands were bent with arthritis, yet she stroked Chloe so softly. She started crying, which made Chloe clean her face of course. I apologized and asked her if she wanted me to move Chloe. She said, “Ah no! This is my little bit of Heaven today!” So Chloe gave her kisses and the lady just cried and talked to her for about 5 minutes. I looked up to see what the reaction of doting hubby was, and he had big tears in his eyes too. He said, “We had an Irish setter for years. 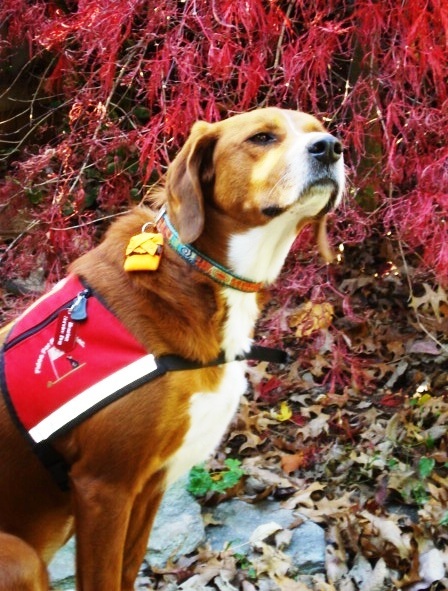 Your dog’s color is very similar.” Chloe went over to let him get in on the lovin’, and that is when he noticed what her vest said. I replied, “Hey! You absolutely made her day. I don’t care if you pet her”. How could I deny a little bit of heaven after all? You know something that took maybe ten minutes of my time, really ended up making someone’s day. Sometimes I hear about a need through my church, or the “grapevine” via Facebook, email, or my blog. I may not be able to meet that need specifically, but usually I can always do something! Yet we have no idea what “little bit” may mean in the life of someone. In that moment in time, that “little bit” may have been “a bit of Heaven”. Who knows what seeds of kindness planted in the life of a homeless man may mean in the days and weeks to come? Some people are pretty cynical about the homeless. I have been myself on occasion. Sometimes you may not be ABLE to help. But isn’t it funny how when we are prompted to “do something”, it is usually when we are able to do something to help? My daughter was telling me over Google Talk today about a friend she took to Taco Bell. Her friend needed some “Kyersten time” and Taco Bell is cheap so works out well for college students trying to do “a little bit”. It was a small thing… didn’t take long… yet friendships can blossom and grow even from the dubious amount of nutrition in a bean burrito with extra sauce. Sometimes people with disabilities get it into their heads that they aren’t “able” at all. That’s a load of hogwash actually. I’ve never seen a load of hogwash, but I’m reasonably certain it looks just like that excuse that people with disabilities aren’t “able”! I know so many people with disabilities who happen to be VERY able. They volunteer in their communities, they reach out to others, they make a difference! Sometimes people use the excuse that they are financially strapped so can’t “make that difference”. You do not have to have a lot of money to be that “little bit” for someone else. It could be an email, card, letter or phone call to just let someone know you care! During our big snow storms these past two weeks, it has been very heart warming to see neighbors who rarely talk out helping each other clear driveways and sidewalks. I like to think it had very little to do with a huge underground effort to get the kids back in school. People were TALKING. Smiling! BONDING… over huge piles of snow! Wouldn’t the world be a nicer place if all of us tried to be that “little bit” to someone at least once a day? Don’t neglect being that “little bit” for those closest to you as well! Why leave them out? I’d rather be used as a “little bit of heaven” in someone’s life than to be the alternative. Wouldn’t you? Still lots and lots of snow! We have had a record-breaking February as far as snowfall goes! Our driveway and sidewalk are finally clear, and what was once 8 foot drifts are down to 5 and 6 feet now. I love to shovel snow (strange, aren’t I?) so it has been a very invigorating couple of weeks. I now have MUSCLES. The sun is going down over my shoulder. It feels good on the back of my neck though as I sit here writing. We are suppose to have another two days of sun before we get some more bad weather. … about how I’m not going to go to training at Fidos For Freedom tomorrow. There’s a friend I’ve been meaning to visit, and I’m going to see if it will be a good time for me to do so. She went in for heart valve repair surgery at Thanksgiving and almost ended up dying. I’m so thankful she is home (though still recovering) now. It has been a long couple of months for she and her family. … not much of anything actually. My son is downstairs doing some homework and my daughter just left for work. Chloe is laying here quietly by my desk. My Elkhound… hmm. I do NOT hear my Elkhound which could mean trouble. I best go check on him, the little rascal. … Elkhounds that find a nice sunny spot and take a nap. The alternative can be very, VERY bad. He’s finally matured out of that puppy “chewing” stage so I don’t have to watch him as carefully as I use too. He sure has enjoyed this snow! I guess that would make sense as he is a “winter breed”. … can feel very cold after being outside for a long period of time. I have found my best defense against “brain freeze” is a stocking cap or ear warmer headband. Keeps all that titanium from deciding it needs to be colder than my body parts. … a movie that I watched long ago. I received a book by the same title in the mail today. I ordered it from Amazon after the recommendation of a friend. “A Walk to Remember”. I need something to read in between my “have to” assignments for this PSYCH/535 class! … to go check on my Elkhound again actually. He’s barking… Ah. A squirrel decided to sit on the other side of the glass door and calmly munch on a peanut. Tyco was going… erm – NUTS. … finish preparations for supper. We are having chicken tacos. It’s a relatively simple meal to make, but I shred the cheese from “scratch” (none of that grocery store bagged stuff that adds saw dust to keep the cheese from making clumps for us! ), cut tomato, cilantro, homemade guacamole, etc. Ya know how you look at a recipe and it says “Prep time: 10 minutes, Bake time: 40 minutes”? Well this meal takes longer to prepare for than it does to actually get the meal together at the end! It’s yummy though, so I can’t complain. … still reading a textbook written by Hall entitled, “Multicultural Psychology”, Tim Keller’s “A Reason For God” (a must read according to my husband), and no “A Walk to Remember” by Nicholas Sparks. … for more snow. But (whispers) don’t tell anyone. I may get strung up! … I did laundry today, dusted, and cleaned the bathroom. I can tell it’s been more than a week since I’ve done the bathroom. Incredible how dirty a bathroom can get with 4 people living here. Even more incredible? The upstairs bathroom is really the “master bath”, and yet everyone uses it. Say what? … burning candles. Today I found I had too though. My 20-year-old daughter was fixing pancakes for lunch (not breakfast) and burned one very badly. I’m surprised the smoke alarm didn’t go off. At least it doesn’t smell like burnt microwave popcorn. Man oh man! Is there anything worse than the smell of burnt microwave popcorn? … burned some microwave popcorn two nights ago. That must be why my nose wrinkles in disgust as I remember the smell. He should be on his way home now. Long commute poor guy, but thankfully he enjoys numerous things he saves “on tape” and listens too on his iPod. … is at work, and then will be stopping by a friend’s work after she gets off. She’s had a hard day. A bit of a “social crisis” unfolded here today. She handles things so maturely though. Although I hate to admit it, she really is ready to transfer to a 4-year school this fall and move away from home (sniff). … looks bone tired. He has been working at McDonald’s for almost 2 years now. It is only 3 blocks away (so when he has no transportation due to family “have to” trips) he is able to walk. But let me tell you… McDonald’s is not an easy place to work! He is the “drive through” voice that you hear. He has been treated sooooo badly. People can be so incredibly mean. They treat him like the fact items are no longer for sale, or are a different price, or their coupon is expired is all his fault. He really comes home defeated sometimes. I keep trying to get him to apply to some other places, but he knows this job “inside and out”. He gets to work just 2 days a week, always has Sunday off… gets Tuesday and Thursday off to take classes at AACC. He tells me the perks are worth the “crap”. ???? … is looking out the window at the sun setting. We haven’t walked in so long, poor hound dog! I’ve seen plenty of cleared sidewalks, so want to try to do that tomorrow! Wish us luck! 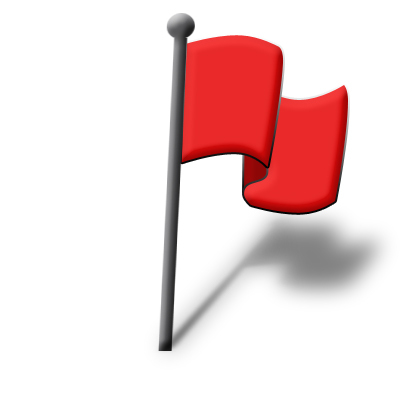 I have little “red flags” in my life… or warning bells if you like! 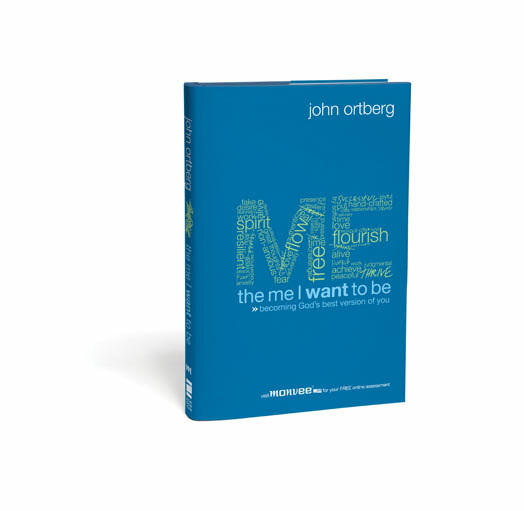 Really, we all need to have them, for they are excellent opportunities for reflection, brain-storming, and goal-setting. Well a little “red flag” waved like mad right in my line of vision this week. When I stopped to heed my little “self-warning”, I was even able to trace it back to when it started. You see, I was developing a bad attitude! Not a bad attitude about any one person in particular, but towards a group of people. A bias, really! It all started when I went shopping at Wal-mart last Tuesday. Chloe has a ball in Wal-mart. This is a good thing, for her enthusiasm is contagious and – frankly? Wal-mart is not one of my favorite places to go, so I can use a little infectious enthusiasm about the money-saving, weekly task! You see? There are a LOT of things to pick up off the floor at Wal-mart. Chloe does an “automatic retrieve”. Granted, sometimes this is a real pain! 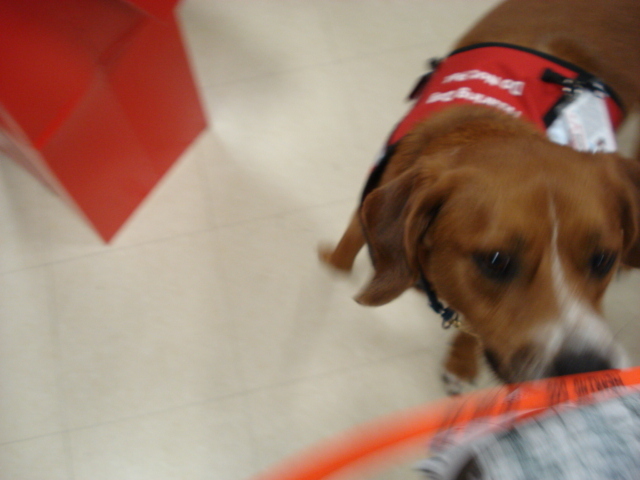 For example, when you are in a store that is notorious for having things all over the floor, Chloe is stopping every few feet to hand me something! An automatic retrieve is when Chloe sees something that I’ve dropped, she automatically and immediately fetches it and brings it to me. She also does directed retrieves, which means she will fetch things I point at, or identify with words she recognizes. Having Meniere’s disease insures there are days that having to reach all the way to the floor, means I’ll also be sprawled out IN IT. Chloe keeps that from happening. If items are just laying around, Chloe really shouldn’t go and pick it up as it wasn’t something I dropped (automatic retrieve), nor is it something I’ve asked her to do (directed retrieve). However, coupons and bits of plastic have a tendency to “be stirred up, move, and re-land” as a shopping cart goes by. Since Wal-mart has shopping carts… everywhere… Chloe thinks every new thing that lands in front of her is something I need. For awhile I was telling her “phoeey” or “drop it”. This hurt her feelings. (She’s very sensitive). I didn’t want to break her solid retrieve commands, so I play along as she gets such a kick out of it and as it is such good practice. The entire experience probably took 2-3 minutes of my time. Yet I stood there, rooted to the spot, for at least twice that long. I’m not sure why I pondered and perseverated on that as long as I did. Have you ever had something happen before where you spent a great deal of time thinking about what you WISH you would have said or done? Little by little, I could feel my attitude changing. 1. Well, you couldn’t understand because you have normal hearing. 2. You don’t know how I feel… you can’t! You don’t fall all day long and run into things! Those kind of thought processes tend to foster one major PITY PARTY. I can feel myself start to feel resentful. It can get ugly pretty quickly left unchecked. In this case… I let one BOZO represent everyone else I know. Truthfully, those with extreme prejudices are the exception, not the rule. 1. Count my blessings with deliberation and certainty. 2. Remind myself why ALL biases are wrong. 3. Make a list of all the people in my life who “get it” and do not have disabilities. 4. Hug and groom my dog, Chloe. 5. Listen to positive, up-beat music. 6. Do something for someone else for no particular reason. 7. If it would be constructive, confront an offender with grace, respect and firmness. Red Flags are Good Things! 1. Spiritually: Does my walk TALK, louder than my talk, talks? Am I daily checking in with God through prayer and reading my Bible? Do I seek to be a blessing to others? Does that start at HOME? 2. Physically: Have a walked at least 4 days this week? Am I watching what I eat? Am I taking my blood pressure medication each day? 3. Emotionally: What have I done for ME this week to just relax and unwind? Do I need an attitude adjustment? Am I living in peace or allowing anxiety to wreck havoc? 4. Mentally: Am I growing? What am I learning in school? Am I giving my best to my team and individual assignments? Are these things helping me reach my goals? 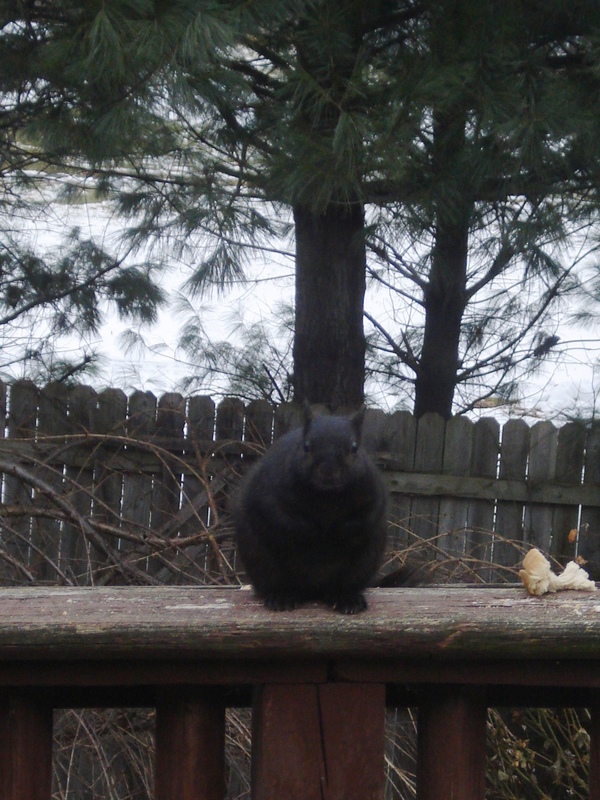 I snapped this picture of one of our black squirrels in between snow storms. Squirrels can be funny sometimes. This pregnant female was eating old bread that I had put out for them, when she paused to look at me as I appeared with the camera. It sometimes makes me wonder who is watching who? For whatever reason, she certainly thought I was interesting! “Look at that animal on the other side of that glass. They live in such a strange cage! What is that thing in its hand that keeps making flashes of light?” Yeah, the squirrel’s point of view would be interesting to know. Unfortunately, I’ve not successfully interviewed any squirrels lately. I had a dog’s eye view of the world this morning. My Meniere’s kicked in with a vicious reminder that I have a balance disorder. I was extremely wobbly and had a couple of tumbles. I ended up sitting on the floor with the dogs for awhile. (Not as far to fall, ya know?) Seeing things from a “dog’s eye view” was something I do not always experience. I sat on the floor enjoying my green tea with Chloe snuggled close. (For ya know? There is only ONE reason I would be on the floor… and that would be to spend one-on-one time with her!). My goofy Norwegian Elkhound was so excited to have me down on his level. He kept running to the family room to grab a dog toy to bring it back to me. He would detour underneath the heavy dining room table to better navigate the chairs that are rarely pushed in as they should be. Since I was sitting there on the floor, I could see up under the table. One long strand of my daughter’s hair hung from one of the bolts. I could see two large oval places in the carpet where the dogs park themselves under the table during meals. (This lent clear evidence to the fact that when my son vacuums on Wednesdays, he does not do underneath the table! GOTCHA!). Everything looks different from about three feet from the floor. My husband came through the room and I had to look up at him to talk. 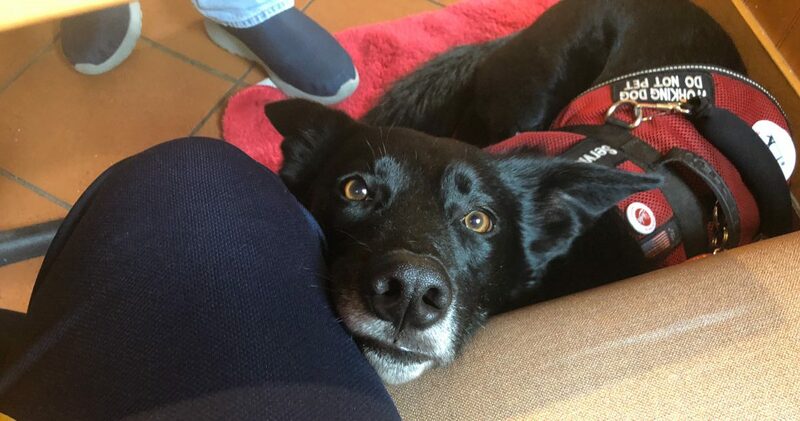 Dogs always have to look up, don’t they? Of course “point of view” does not literally mean sharing the same VIEW as another physically. The phrase itself means the mental position of considering something such as an opinion, a story, theory, or suggestion of another. What Shapes Your Point of View? Rarely will two people have the same point of view on every topic. Your point of view is often shaped by your life experiences. I’m taking Multicultural Psychology right now, and it took my class nearly a week to agree on a definition for culture. It use to be that a person’s culture had to do with your genetics, race and ethnicity. The field of psychology has been forced to re-define what a culture group is as obviously far more influences the development of an individual than their genes, race and ethnic background. Religiosity, gender, socioeconomic status, disability, sexual orientation, politics, victimization, education, war, natural disaster and much more will affect a person’s development and evolving point of view. I think it is important to understand what has shaped your own point of view. For one thing, this introspective activity is bound to make you more aware of how the people in your life have a different point of view because of their culture groups. Some psychologists call this broadened definition of culture a new word… sub-cultures. A family can have a number of sub-cultures even within the same house. My husband and I still have both children living at home right now. Believe me… a 19-year-old boy and a 20-year-old girl have different culture groups than my husband and I do. Their very AGE sets them apart from us and provides unique challenges as we navigate living together peacefully in spite of our differences. At work, I am the only person who has a disability. Thankfully, after working there for seven years now, no one actually treats me like I have a disability. Because I have Chloe now too, they know that she is helping me. As we maneuver up and down the dangerous staircase each school day, they don’t stand and watch with a catch in their breath waiting to jump in and help. They know Chloe can get me up and down the stairs safely. My students no longer crash into each other trying to reach a paper, pen, eraser, or book that I drop in the classroom. Instead they smile and watch Chloe hop up to go retrieve the item for me. (Although many times they are smiling because Chloe has to stretch/yawn first before jogging over to assist). I absolutely believe that people with disabilities are their own culture group. You may not even have the same disability as another person, but there is something unique about living a life WORTH LIVING in spite of a disability. People with disabilities have unique ABILITIES. It changes your point of view. What is unique about YOU? What has helped to shape your point of view? Have you ever identified your culture groups? I think that by fully realizing all your OWN puzzle pieces, it makes it much easier to see the completed picture puzzle of others. It helps to keep us from focusing on one confusing, annoying puzzle piece. All the unique puzzle pieces combined make one beautiful person. It’s snowing! This is “the big un” according to the local and national meteorologists. We could get anywhere from 26 to 32 inches. I can’t wait! Right now it is just drifting down pretty calmly, but more than what one could call “flurries”. The neighborhood was quiet until people starting rushing home from work about an hour ago. They park, stick the windshield wipers up… and then grab the bag of bread and milk that they just collected from the grocery store after knocking down the lady with the cane for that last loaf of Wonder bread. … about how much I enjoy snow. I love shoveling the stuff and I get a hard time about that. There is something pretty magical about the sound of a metal snow shovel slicing through the snow, lifting, and tossing it on to the nearest drift. I love looking behind me to see the path I’ve cut across the driveway, back deck, or sidewalk. Aren’t I strange? 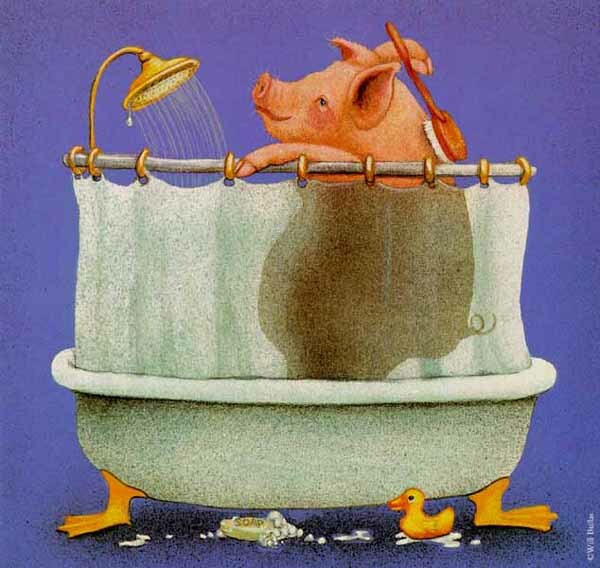 … the bathroom fan running. Hubby didn’t go to work with the incoming blizzard. He did run to the gym, however, and came home to shower here. That means I have a load of laundry to do by now. … my godly parents. Got a “Skype” (webcam) phone call from my mother this morning. Daddy is having some health issues again which could be potentially serious. I “hear” the worry in both their voices, but I’m EVER SO THANKFUL they both love and trust the Lord. Praying for them makes them seem closer than they really are. I’m guessing they are about 16 hours from here now that they live in central Florida. 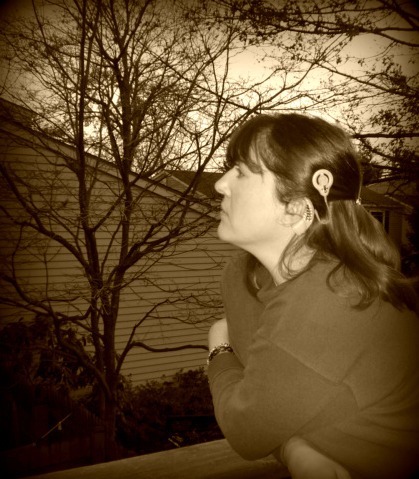 … blue jeans, black turtle-neck, gray sweatshirt, thick socks, hiking boots, and February bling on my cochlear implant. … is sometimes mistaken for a bluetooth phone. Go figure. Side by side, they don’t look a thing alike! … what it was like to be in labor with my oldest – my daughter Kyersten – twenty years ago today. It wasn’t “pleasant”, which is why remembering makes my heart accelerate and blood pressure go up. I was determined to have her “naturally” with no drugs. (Youth = stupidity). I had “back labor” and was practically screaming by the time she finally crowned. Happy birthday Kyersten! … absolutely NO WHERE. Blizzard coming… ‘member? We are hunkering down for a weekend stuck in the house. Movies, check. Popcorn, check. Books, check. School work to do, check. … a culture. At least not defined by most psychologists. There is a new group however, explaining that a culture can be a group of people who share a common disability. Funny thing that word disability. It gets some folk’s hackles up, while others embrace it a little too fondly. … a textbook written by Hall entitled, “Multicultural Psychology” and some more deep thoughts by William Bennett. … for as much snow as they are calling for! … I think we will have sandwiches and chips for supper. I was going to have left over “NC style BBQ”, but folks warmed up a bunch at lunch. I don’t think I have enough to serve for supper now. Oh well… I love the vinegar-based BBQ recipe I found for my slow cooker. I’ve fixed it twice in two weeks now. … I need to remind Chris that he was suppose to vacuum on Wednesday. I can look around and see that it did NOT get done. I have to remind my 19 year old from time to time that I am DEAF – not BLIND. … is doing laundry. I have a load in the dryer, and a load in the washer waiting to be transferred. Best perk of laundry is folding clothes fresh from the dryer. LOVE IT! … is doing homework. Or so he tells me when I “IM’d” him to remind him about the vacuuming. … is curled up in her bed beside me here in my office. She’s not nearly so excited about the snow falling as my Norwegian Elkhound. If you missed the story about the testing, click here! We received Chloe‘s DNA report back today from Wisdom Panel Insights. 50% of the DNA are from signals “not strong enough to identify with confidence” as she has “mixed-breed ancestors beyond three generations back. (Another reason could be that some of the DNA signals are from breeds that fall outside the 170+ breeds identified by this company. For those of you who are curious… no one’s guesses were breeds NOT identified by this company). Chloe is 25% Irish Red and White Setter. This is a sporting dog that I have never heard of before. Chloe is also 25% Rottweiler. Because she is at least 25% of each of these breeds, it is called an “Intermediate Breed” marker.We were surprised by BOTH of these! 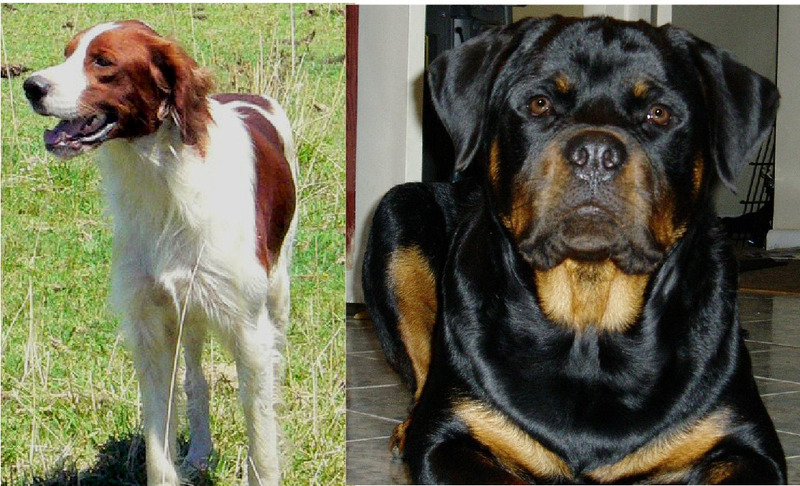 I had never heard of the Irish Red and White Setter, and I’ve never seen any physical or temperamental quirks that made me think Rottie either! I had expected to be surprised though, so I’m not disappointed! The wisdom panel explains that when reading your report, owners should keep in mind that all physical traits of the breeds found may not always be apparent in YOUR dog. 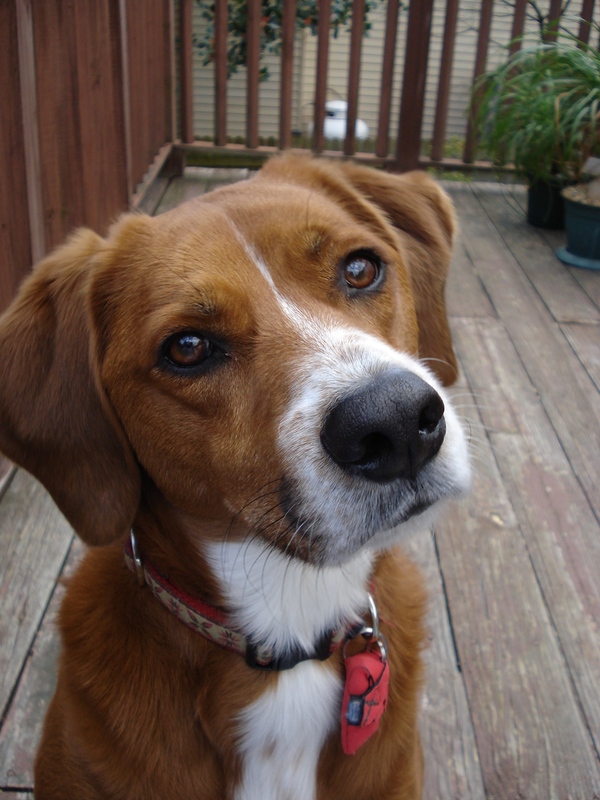 A mixed-breed dog’s appearance varies depending on the overall mix of breeds found and the specific genes inherited from each of those breeds. When dominant and recessive genes combine from the different breeds across the generations, unique and unpredictable combinations can occur. The Irish Red and White Setter is a close relative of the Irish Setter breed. Historical records refer to a common Red and White Spaniel which bears a striking resemblance to the breed, and in the development of the Irish Setter breed, dogs were bred primarily for their field talents, rather than their coat color. It was not until the 1800s that the red coloring became popular in the show ring and an attributed characteristic of the Irish Setter breed. As red dogs predominated in the latter part of the century, a public outcry caused multiple efforts to keep the traditional coloration. The breed has persisted to the present day and was only recently fully recognized by the AKC in 2009. These dogs remain more of a field dog than a house or show dog, and when properly trained remain an obedient and loyal companion. Rottweilers are an ancient breed, dating all the way back to the early Roman Empire. Roman troops were accompanied on their travels by the Roman cattle dogs, which helped herd the cattle that would later serve as food for the soldiers. The travels of the Roman armies took them through Europe and Germany, and specifically the town of Rottweil. This eventually became a cattle area and the descendants of the Roman cattle dogs were used to protect the herds. Rottweilers made excellent working dogs and were used to pull carts as well as herd and protect. They were also known for their ability to hunt boar. By the end of the nineteenth century, the breed was virtually extinct to the point of there being only one female left in the entire town of Rottweil. Before World War I police dogs were needed, and the Rottweiler was chosen for the task due to their strength, intelligence and ability to follow directions. The first Rottweiler club was founded in Germany in 1907 and Rottweilers were saved from extinction. The breed was recognized by the American Kennel Club in 1935.